Whenever a new actor is cast as an iconic character, there will naturally be comparisons of the new actor, and those who have come before. Fans engaged in heated debates over which Batman was better, Christian Bale or Ben Affleck, and which Joker delivered the definitive performance, Jared Leto, Heath Ledger, or Jack Nicholson. These comparisons started sprouting up again when Tom Holland was cast as Spider-Man, making his debut in last summer's Captain America: Civil War, leading into this summer's stand alone adventure Spider-Man: Homecoming. Tom Holland just threw some new fuel on this comparative fire, claiming that his Peter Parker could beat up those Peter Parker's who came before him, played by Tobey Maguire and Andrew Garfield. When Tom Holland made his debut as the web slinger in the Marvel blockbuster Captain America: Civil War, he became the third actor in the past 14 years to play Peter Parker/Spider-Man. Tobey Maguire played Spidey in Sam Raimi's trilogy Spider-Man (2002), Spider-Man 2 (2004) and Spider-Man 3 (2007). Instead of making a fourth movie with Sam Raimi and Tobey Maguire, the studio decided to reboot the whole franchise, casting Andrew Garfield for 2012's The Amazing Spider-Man and its 2014 follow-up The Amazing Spider-Man 2. Short List Magazine caught up with Tom Holland, who was asked whether he thought who would win, if all three Spidey's were to meet and throw down in a fight. Here's what Tom Holland had to say below. Naturally, that whole point is moot, since it would likely take some sort of cinematic miracle to bring all three versions of this character together on the big screen. Speaking of fights, many fans were surprised to learn that Tony Revolori was cast as Flash Thompson, a role that has been previously portrayed by much larger actors, with Joe Manganiello making his feature film debut as Flash Thompson in the 2002 Spider-Man, and Chris Zylka playing Flash in The Amazing Spider-Man. Tom Holland revealed that this Flash Thompson character is still a bully to Peter, but not in the physical sense. Here's what he had to say below, alluding to his time spent "undercover" as an American high school student to prepare for this role. "American high schools are so different to British ones. Bullying wasn't really a thing, so when they cast Flash Thompson they knew they didn't need a 6ft 5in jock to beat Peter Parker up. They needed a rich, smug kid commenting on how bad his trainers were. And I did it to practice my American accent." One of Tom Holland's co-stars is no stranger to the superhero genre, with Michael Keaton taking on the villainous Vulture role. One of his best-known roles was as the DC Comics hero Batman in the 1989 Tim Burton movie Batman and the 1992 follow-up Batman Returns. When asked about his interactions with Michael Keaton, Tom Holland revealed that his co-star never let the youngster forget that he was once Batman. "Pretty cool. He's a badass. We have a fight in the movie and I punch him. He turns around and says [in a deep voice], 'I'm Batman.' He kept doing Batman quotes on set." Spider-Man: Homecoming will have the July 7 weekend to itself this summer, and while we'll have to wait a few more months to see this in theaters, Sony and Marvel have already started working on Spider-Man: Homecoming 2. The studios have set a July 5, 2019 release date for the sequel, which will likely be the second installment of a trilogy. 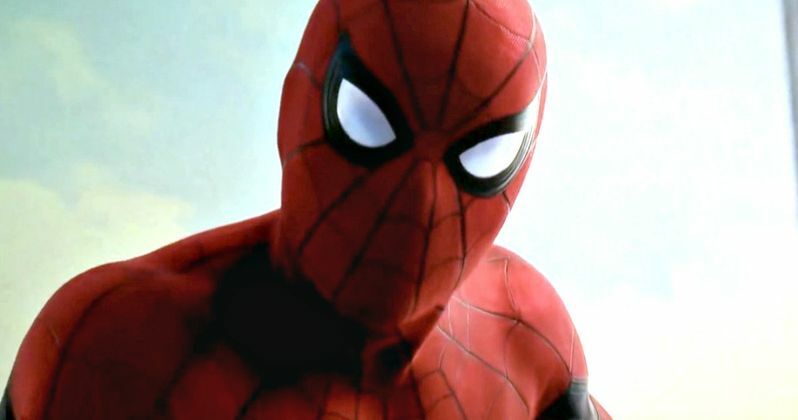 There have long been rumors that each one of these movies will focus on a year of Peter Parker's high school career, but that has yet to be confirmed. Hopefully we'll get a new trailer for Spider-Man: Homecoming in the very near future.